We sure don't get to look at Ozzie much, do we? Back when I thought the Red Wings were headed to the golf course this month rather than the Stanley Cup playoffs, I certainly wouldn’t have predicted that they would go on a 10-0-2 streak and become the team nobody wants to play. The team I don’t enjoy watching the Wings play is Nashville, despite an 11-round, 1-0 shootout victory in Nashville a week ago and a 4-3 OT loss in Hockeytown Saturday. Both the Wings and Predators should be somebody else’s problem in the first round of the playoffs unless they somehow manage to finish 4-5 in the Western Conference. Now that would be just awful! Score: Predators 4, Wings 3 (OT). Game #78 (4 games to play, 8 points), 96 points, 6th place, 2 points (with 2 games in hand) on Nashville. The Kings are just a point behind (95, also 4 games remaining), and both the Avs and Flames, tied for 8th with 89 points, should be more each others concern than the Wings — as long as they keep winning. Up next: At Philadelphia (boo!) at 12:30 p.m. ET on NBC. I wonder how many times they can mention Sidney Crosby? What I liked about the game: Pavel Datsyuk scored his 26th goal with 37 seconds to play and the goalie pulled to tied the game a 3-3 and assure the Wings of at least a point. What I didn’t like about the game: Playing the Predators is just so darned hard. Could it be that the teams are so similar? If you watch a replay of the goals, they even look similar, especially those by defensemen from the point. The BIG question: I really shouldn’t be doubting Jimmy Howard at this point, should I? Interestedly (or not), Chris Osgood starts against the Flyers for the first time since Jan. 27. Mood meter: It can change SO quickly, even when the Wings haven’t lost in regulation since March 9. Datsyuk and Zetterberg: Anybody got a clue? So, remind me. Why did I start this blog three games ago? Oh yeah. To follow the Wings’ push to the playoffs. Instead, they’re in free fall. Coach Mike Babcock can’t even remember when the season started (see his quote below). Nashville next on Friday; they’re only 2 points ahead of the Wings in 7th. And at Pittsburgh on Sunday at 12:30 p.m. on NBC. Don’t embarrass yourself, boys. Score: Wild 5, Wings 2. Quote: “We gave up two power-play goals. We haven’t given up power-play goals like that since our trip to Europe in September or whenever that was,” coach Mike Babock said. What I liked about the game: Pavel Datsyuk scored two goals. So the rest of the boys got shut out. What I didn’t like about the game: Goalie Chris Osgood is 1-6 since Nov. 7. 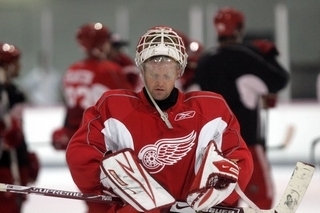 Any more questions about who the Wings’ goalie is? What I don’t like about the way the Wings are playing: Detroit is 1-3-3 in their last seven games with five blown leads in the third period. In search of: Instead of thinking that players returning from injuries were going to turn them around, the Wings need to continue to focus on doing the little things well. Otherwise, the big thing for this team this year, a playoff berth, is going to slip away. What is: We’ll dispense with “what might have been” in a 5-2 loss. The Wings are still tied for 8th with Calgary, but the teams behind them are closing in, the teams ahead of them pulling away. The 13th place Blues are only 5 points behind Detroit, and everyone will tell you that St. Louis is having a terrible year.